The Serene Stamper: Sale-a-Bration Party! Hi Friends! 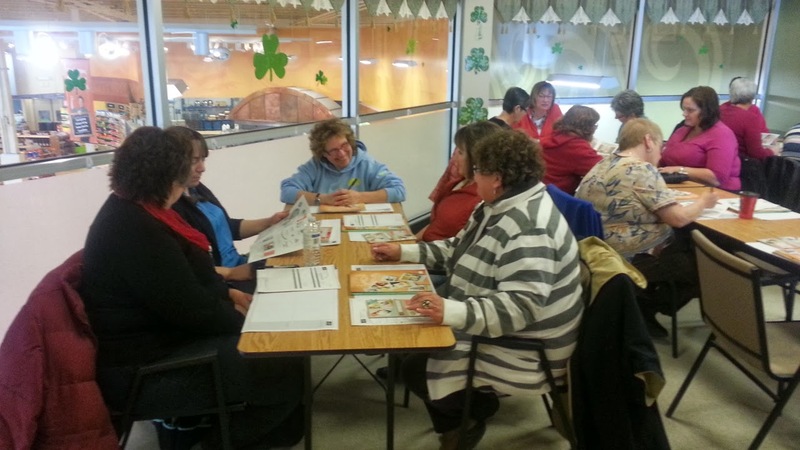 On Saturday I drove to Woodstock, NB to have a Stampin' Up! workshop for my friend, Misty. 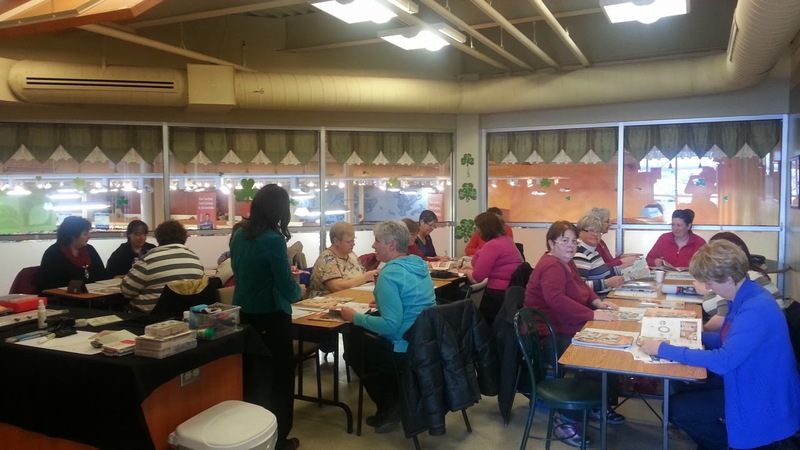 She invited a lot of her friends and we used the community room at the local grocery store - which was awesome! 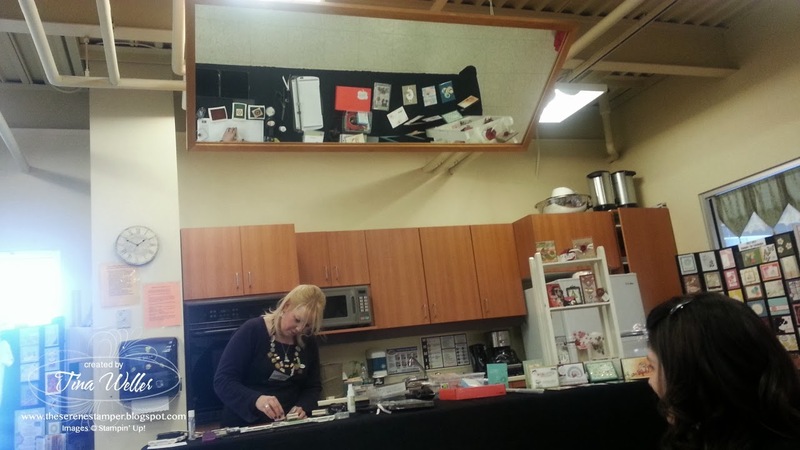 This is where they hold cooking classes so there was a big mirror above me which was perfect for everyone to see what I was demonstrating! I kept the projects really cute and simple but as it turns out most of the guests except a couple were all ready stampers! 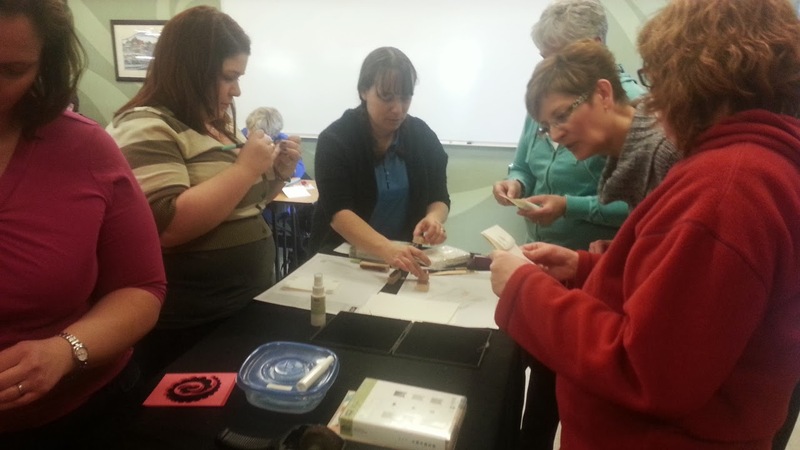 But I think it's safe to say the projects were a hit because the most of the ladies bought everything I used in my demonstration and for the make and take project and they all got one or two or even THREE free Sale-a-Bration items of their choice! Isn't "FREE" just the best? 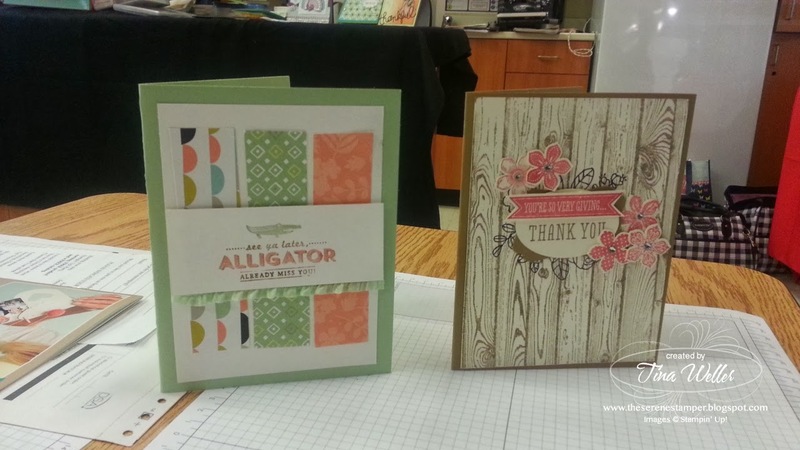 At least with Stampin' Up! it is! And Misty received close to $300 in FREE Hostess Benefits and FOUR 1/2 price items! Wowsers! I am so pleased for her. Misty is also going to buy the starter kit during Sale-a-bration and join my "Serene Stampers" group and we're both super excited! 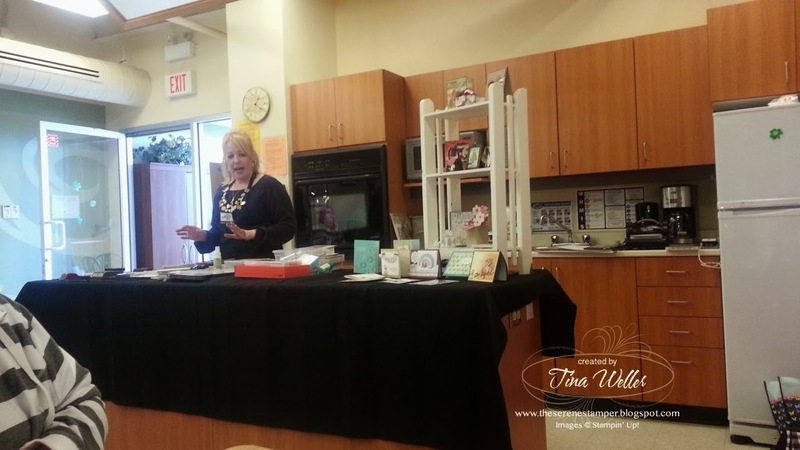 If you would like more information about having your own Sale-a-Bration Party (workshop) and/or how to get your own Starter Kit click HERE or feel free to contact me at serenestamper@gmail.com and I'll more than happy to help you! The guests are beginning to arrive! 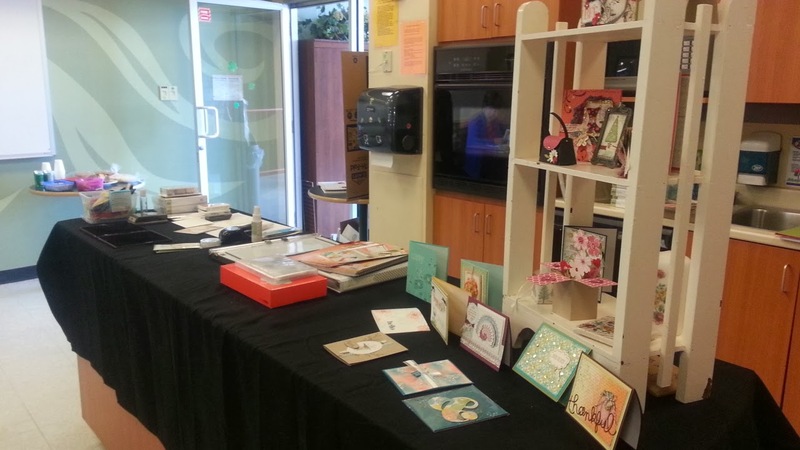 Lots of cards and projects on display. 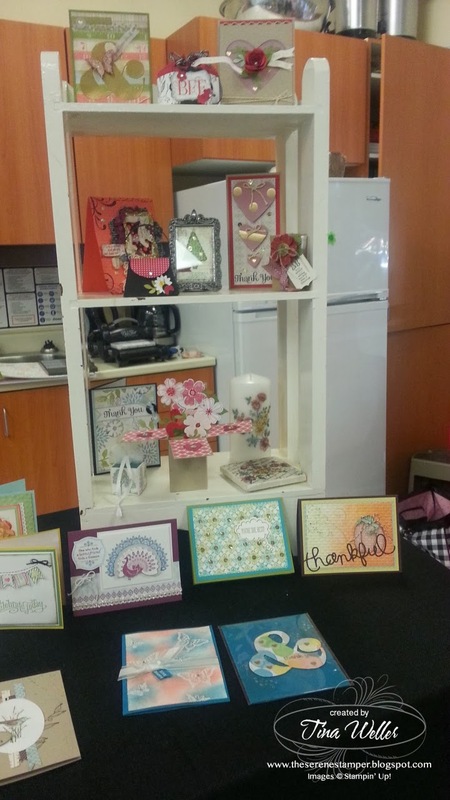 Misty had the brilliant idea to bring this shelf to showcase my projects and all the many things you can do with stamps - candles, tile coasters, candy holders, altered frames, etc. From this photo can you guess which project was the most popular? If you guessed my "Card in the Box" you'd be correct! (You can see it on the bottom shelf). I think almost everyone at the party purchased the Flower Shop Bundle that I used on this fun project! Click HERE to see my video tutorial so that you can make one too! 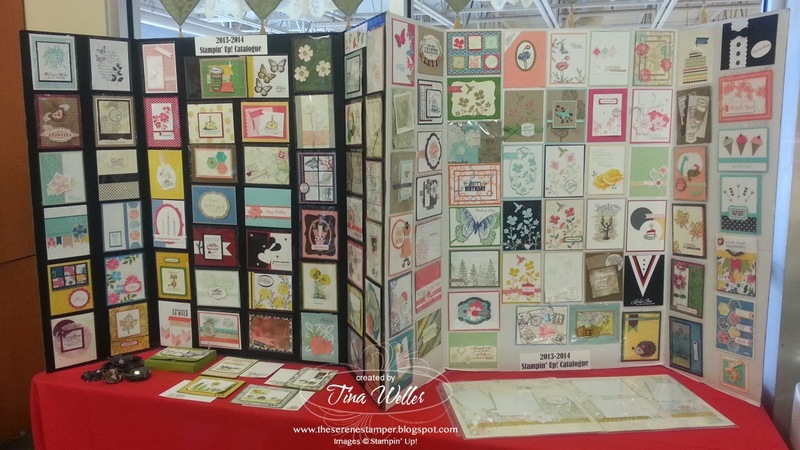 My display boards with swaps I received at Stampin' Up! convention. All ready to demonstrate some fun cards! 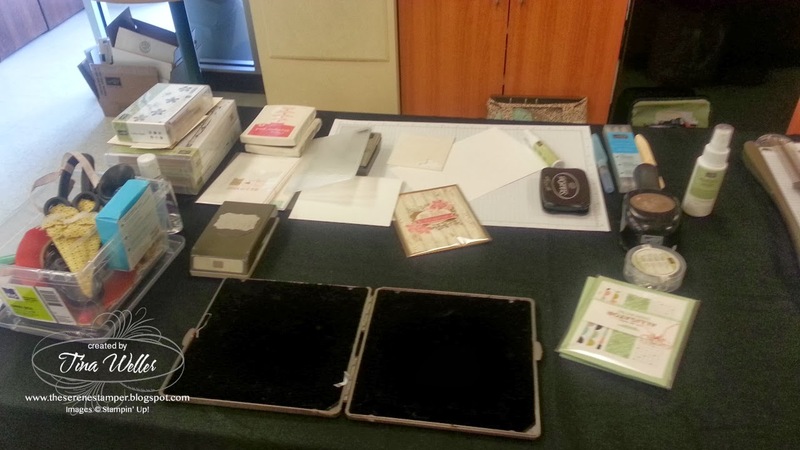 Sharing Stampin' Up! with others is such a passion of mine! I just LOVE it! I get paid to stamp and play with glitter! How cool is that?! And you can too! Click HERE. 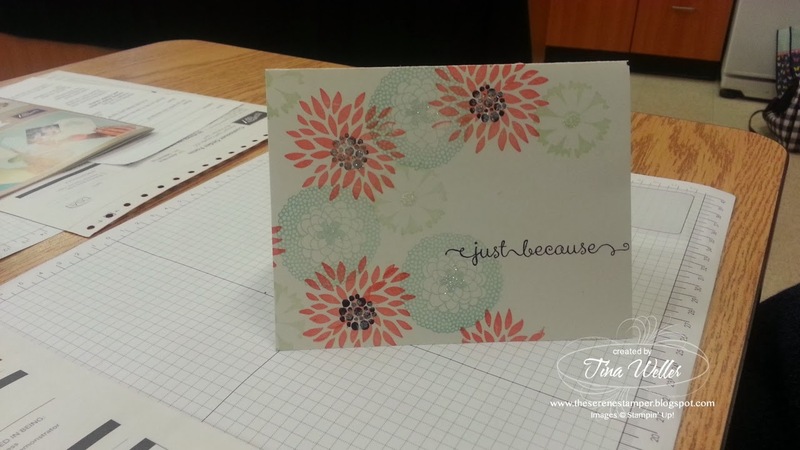 For this card I used the Petal Parade Sale-a-Bration stamp set and "A Dozen Thoughts" set. 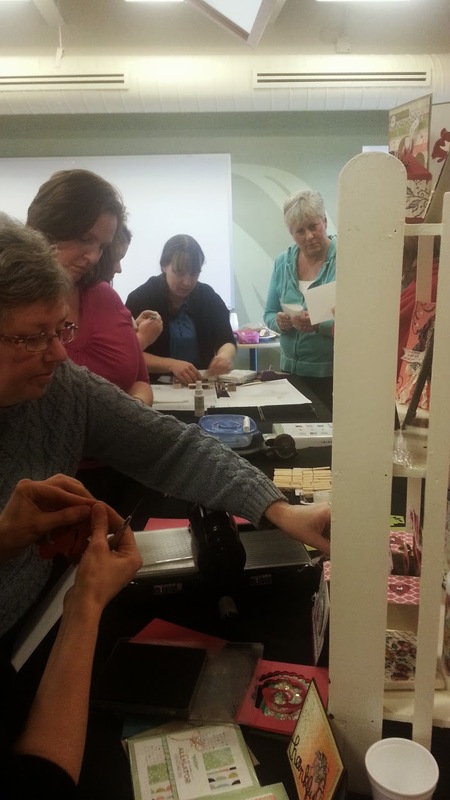 The ladies enjoy time looking at the displays and stamping their projects! 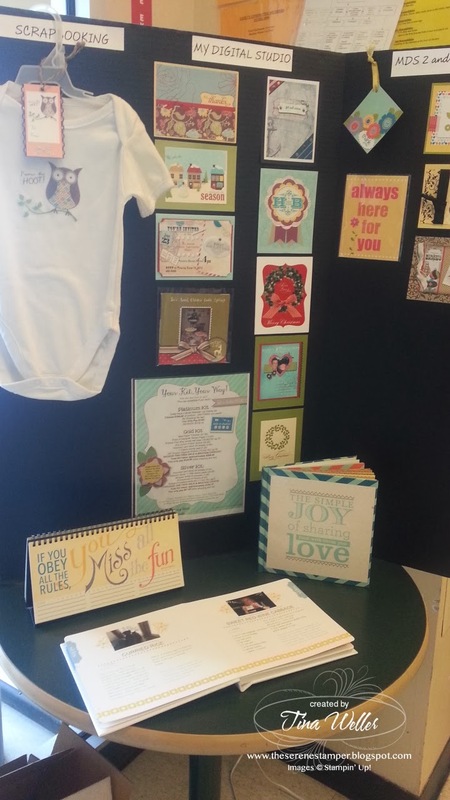 The make and take projects featured the Banner Blast Sale-a-Bration Stamp Set and the Spiral Flower Die. I forgot to take photos! 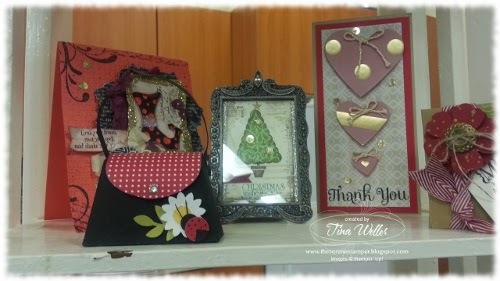 But the Banner Blast card was one I cased from the Sale-a-Bration brochure on page 5 and the other project was an altered clothespeg with the rose - I'll make a video for you as soon as I can, because these are stinkin' cute and so fast to make! I'm going to be out and about a lot for the remainder of the week, so I may be MIA for a few days but I'll be back on Monday with some exciting news! 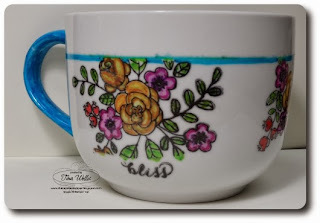 And speaking of exciting news, I have a winner from my current contest, for the Stamped Sharpie Mug, and SUSAN, you're the winner! I'll contact you for your address and get your mug sent to you! Enjoy! And many thanks to all of you who leave me comments - I really appreciate it! I am always humbled by my blog readers and to each of you, a big hug and a big thank you! What a successful event!! Congratulations to you and Misty too :) Love the projects, beautiful as always!! I am so glad I found your site, Tina. You are an inspiration!